Lindemann Hypnosis Group, LLC, located in Fort Collins, Colorado, specializes in Hypnotherapy, Time Line Therapy (NLP) and Smoking Cessation, serving clients throughout northern Colorado and southern Wyoming. You can break free from negative emotions, limiting beliefs, fears and bad habits with hypnosis. Do you live far from Fort Collins, Colorado? We also offer convenient Phone Hypnosis to clients throughout the United States. Subscribe To Our Free Newsletter Enrich And Expand Your Reality! Factoid: Ninety percent (90%) of your actions and behaviors arise from old unconscious habits and beliefs. How can you change what you are not conscious of? The answer is hypnosis. Change your mind and you can change your life! 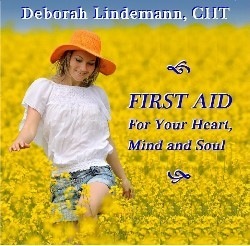 First Aid for Your Heart, Mind & Soul is Deborah Lindemann's best-known hypnosis CD, studio recorded for superior audio quality. If you are experiencing stressful issues in your life, if you are seeking peace of mind or inner guidance, then this is the healing oasis you've been looking for.